Increase your creativity and mental abilities with this innovative training program for both the brain and mind. Mind Gymnastiks users report enhanced creativity, clarity of thought, increased awareness of subtle perception, and improvements in overall brain performance. It contains BioPulse™ frequencies from 1-30 Hz (delta, theta, alpha, beta, and k-complex). This program uses complex psychoacoustic tonal patterns to produce altered states of awareness and to stimulate neurological networks in the brain. Some of these sounds are rather odd. Just let them remain there in the background. There is no need to focus on anything other than the voice that guides you through the exercise. Stereo headphones are required in order to receive maximum acoustic stimulation of the brain. Make sure that you are listening to the program with the left headphone over the left ear and the right headphone over the right ear. Headphones are usually marked with an L on the left side and an R on the right side. Generally speaking it is preferable to listen to the recording sitting upright in a comfortable position. However, some persons may need to lie down due to weakness. In this case, avoid the temptation to go to sleep, as some of the exercises will take you into a very deep brain state. You now have in your possession a powerful tool for boosting brain function and performance. Treat it with respect. We strongly suggest that you not listen to any of the tracks on this recording until you have completely read all of the enclosed literature. Do not listen to this recording in situations where alertness is required such as operating machinery or while driving an automobile. Due to powerful changes in brain processing, the following persons should not use this program without medical and/or psychiatric supervision: epileptics, persons with a history of seizures, schizophrenics, psychotics, persons using psychoactive medications, stroke patients, and/or persons with organic brain dysfunction. Mind Gymnastiks may be helpful to such persons as part of their rehabilitation program, but supervision in such cases is highly advisable. Similar to physical exercise programs, which train different muscle groups for increased strength and endurance, Mind Gymnastiks stimulates different areas and abilities of your brain/mind. This is accomplished through a combination of guided imagery and complex psychoacoustic stimulation of the brain. Remaining conscious while in a deeply altered state of consciousness is one goal of this program. The ability to remain attentive to the exercises will allow you to affect a greater change in your nervous system, as well as to increase your ability to focus. In the beginning you may find it difficult to remain focused during the entire length of a particular exercise. Be patient. Increased attention is a learned ability; it may take time for you to achieve it. Remember that the learning process is often a few steps forward, then a couple of steps back. You can, if you wish, leave your eyes open while doing the exercise. In this case, fix your gaze upon a point or object while you place your internal focus or attention on the exercise. You may get irritated with some of the exercises from time to time, or you may have some other type of emotional response. This can occur because an exercise is forcing you to use areas of your brain/mind that you are not accustomed to using. Stay with the exercise and let your emotions just be there. Don’t try to alter them. Just let them be, while the focus of your attention remains on the exercise itself. If you experience a headache at any time while listening, decrease the volume (which decreases the intensity of the psychoacoustic stimulation taking place). This might occur with some individuals during “Brain Stim” (Track 1). If you continue to experience a headache after decreasing the volume, stop the recording. Take a break from listening for a day or two and then try again — this time at a very low volume. Some individuals (very rarely) experience headaches or discomfort while doing the exercises (Tracks 2, 3, and 4). This is usually due to over-concentrating. Just relax and let the exercise unfold. A light attention rather than concentration will serve you best. In some rare instances, the exercises may be challenging the brain beyond its inherent capabilities. This may be the case with stroke patients or others with organic brain dysfunction. Talk to your health professional if headaches or physical discomfort continue to arise when you listen to the recording. There are four separate tracks on this recording. They consist of a Brain Stimulation sequence and three brain/mind developmental exercises. Always start each Mind Gymnastiks exercise with “Brain Stim.” It will supercharge your brain, allowing you to be more focused during the exercises. You can engage in other activities such as reading, writing, etc., while you listen. The sequence is highly stimulating. If you wish, you can place your attention in your brain and feel the activation produced by the complex tonal matrices (but this is not necessary). This sequence lays the neurological groundwork for the program. Although the exercise seems quite simple, it challenges a wide range of brain structures. 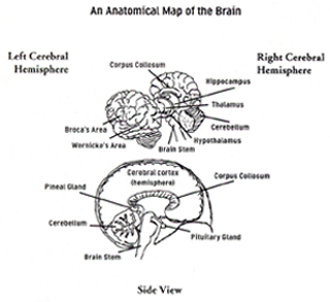 This exercise makes extensive use of cross — lateral stimulation, thereby activating the corpus callosum, which connects the two hemispheres. In addition, imaging abilities are greatly increased due to the activation of internal sensory modalities. This exercise uses an imagined point of light that circulates through the brain. It continues the work of the first two exercises, while stimulating “self-healing” processes through internally perceived light. It is suggested that you listen to “Brain Stim” (Track 1) immediately followed by one of the exercises. Do not listen to more than one exercise at a time, including “Brain Stim” — at least until you have gone through the week-three listening protocol noted below. Listen to a full sequence (“Brain Stim,” plus one exercise) at least once a day. For maximum development, listen to one full sequence twice a day — with several hours between sessions. Always rest for a few minutes after completing an exercise before turning your attention to outer activities. After this twenty-one day period, you should be noticing distinct improvements in mental abilities and overall brain performance. To continue your progress, listen to one full sequence just once or twice a week. If you have the time and motivation, you can do a Mini-Brain Intensive by listening to the entire recording in one session. Start with “Brain Stim” and simply go through all three exercises, back-to-back. When you finish the last exercise, lie down or rest for at least ten or fifteen minutes before entering back into your everyday activities. This rest period is crucial because it allows your brain to integrate the experience before turning to other tasks. Mind Gymnastiks is built upon a multi-leveled strategy to increase both brain function and mental performance. By challenging the mind through various Psycho-Neurological Tasks (PNTs) — such as rotating or moving geometric shapes through the brain — and by creating complex internal sensory experiences, unused abilities are increased, and, it is believed, areas of the brain associated with these PNTs will be stimulated. In this construct, the mind is seen as a process that runs parallel to the brain. Thus, the mind does not exist apart from the brain, but is a result of brain function. This is not to say that there may not be an aspect of consciousness that exists independently of the brain and nervous system; however, normal everyday mental experience is undoubtedly linked to physical changes in the brain. While it is clear that physical alterations in our brains create changes in our mental experience, research also shows that our mental experience can create measurable changes in brain processing. In other words, by virtue of your own consciousness and what you choose to do in your mind (via thought, attention, and feeling), you can affect physical processes in your brain. The psychoacoustic tonal matrices that comprise this program are designed to produce altered states of consciousness. This combination of psychoacoustic sound, in tandem with the exercises, increases the likelihood that new neurological networking may be generated. Through the various PNTs that make up Mind Gymnastiks, many different areas of the brain are brought into play at the same time. It has been observed that this increases overall coordination within the brain/mind and can improve both brain performance and mental abilities. See the diagram below to identify various areas of the brain that are “worked” by the PNT exercises.